A good pot roast has seen me through the worst of times. In our family, in times of major life crisis, we turn to the purest form of love and comfort – a pot roast. Somehow the stewed chuck roast and vegetables provide a warm hug to dry up your tears and help you find the courage to face another day. Of course, we eat pot roast on happy days too – but many a phone conversation between the sisters and my mother involve the direction – well somebody get over there and make her a pot roast. Unfortunately for Allison, this involves a plane ticket, sadly resulting in far fewer pot roasts delivered to her abode. Don’t worry, I’m not having a life crisis. This pot roast was prepared simply to signify the impending change of the seasons and provide a key one pot meal that could be made in advance (Soccer season has started!) then served again -even more deliciously in leftover form. I never eat leftovers. Ever. Luckily my husband does without the slightest complaint, I think he enjoys them actually. But soups – that is a different story – soups are designed to get better with age and therefore provide none of the diminished quality and disappointment I find in traditional leftover dinners. This method was taught to me by mother, she made it for us and now we all make it for each other and our families. I’ve never been fond of the word stew – it sounds like something you eat when you don’t have enough money to buy something better. Kind of like porridge or spam. 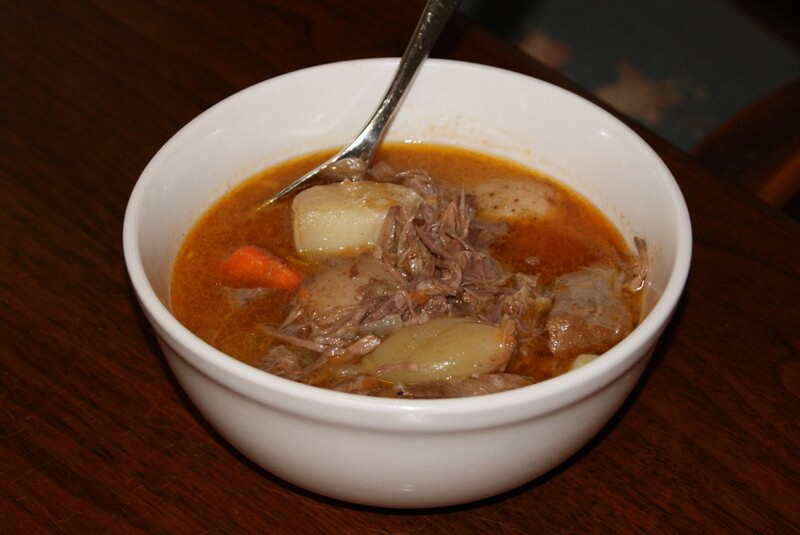 But I know that’s ridiculous, so I looked up the definition of stew and it turns out – pot roast is exactly this. I was going to refer to this as Braised chuck roast, but braising refers to a small amount of cooking liquid – as I would with artichokes. Stewing means liquid almost covering the meat. The easiest place to go wrong with this recipe is by not browning your meat long enough – truly you want to brown it until you’re almost afraid of burning the roast. The second word of caution – though I’ve made this type of meat THOUSANDS of times and only run into the issue once, but I feel compelled to relate – involves frozen chuck roast. Should you be using a previously frozen chuck roast – PLEASE be sure your roast is completely thawed before you begin browning. I ran into this problem in haste in July and blistered my face terribly when the hot oil popped up at me. Don’t worry – it’s healed quite nicely and you can barely tell now. As for the onions in the recipe – they are crucial – albeit hard to find. What you want are small onions in a glass jar like this. You don’t need this Aunt Nellie’s brand, that just seems to be the only kind I see in Texas. In the Midwest they were called something different. They’re generally in the canned vegetable aisle along the top row somewhere – possibly near beets. You drain them, then pour right on in. For some reason, they are really hard to find so I may have to start ordering them by the case like I do with my pickles. In a pinch, like this week, I went with the small bags of white boiler onions found in the produce section. This works fine but is so much more labor intensive, involving boiling quickly, about a minute, then peeling each one before adding to the stew. Frankly, I just don’t have that kind of patience. Not to mention they are so much more expensive this way, I think the package of approx 10 onions costs $3.95. Thanks to my mother for teaching me this staple recipe, I don’t think I could possibly function without it. Next time you want to send extra support to a loved one – you’ll know what to make. Season all sides of roasts with kosher salt, pepper, and paprika. Pour flour into a small bowl, then coat all sides of roast with a layer of flour, shaking off the excess. Heat a large – heavy bottom required – stock pot on medium high heat on the stove. Add about 1 and 1/2 tablespoons of olive oil, then brown one roast at a time on all sides. Continue to move roast around about every five minutes. Keep your eye on the flour mixture, as this will be the base of your gravy, if it looks like it’s starting to burn reduce your heat a bit. Let first roast rest on a plate and brown the other piece. 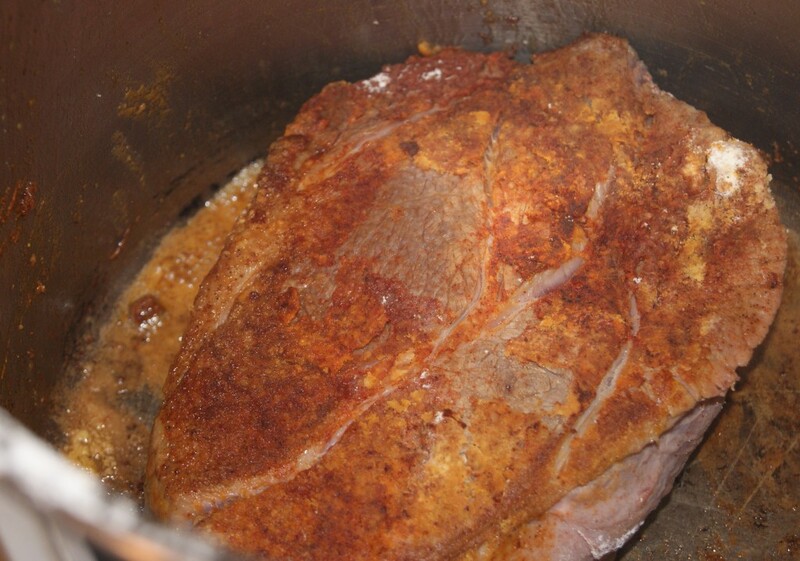 When meat is completely browned, add reserved roast and any accumulated juices back to pan. The entire browning process should take you about 40 minutes. Cover with water almost, but not quite, covering the roasts completely. Add 2 teaspoons salt and 16 turns ground pepper. Cover stock pot with a lid, and reduce heat to medium. Check after 1 hour, reduce heat by about 25% then cover and cook another hour. Chop carrots in half lengthwise, then into 2 inch segments. Chop potatoes in half lengthwise, then into thirds. Add both to to stew. Drain onions, then add. Cover stock pot with lid and cook another hour and a half. 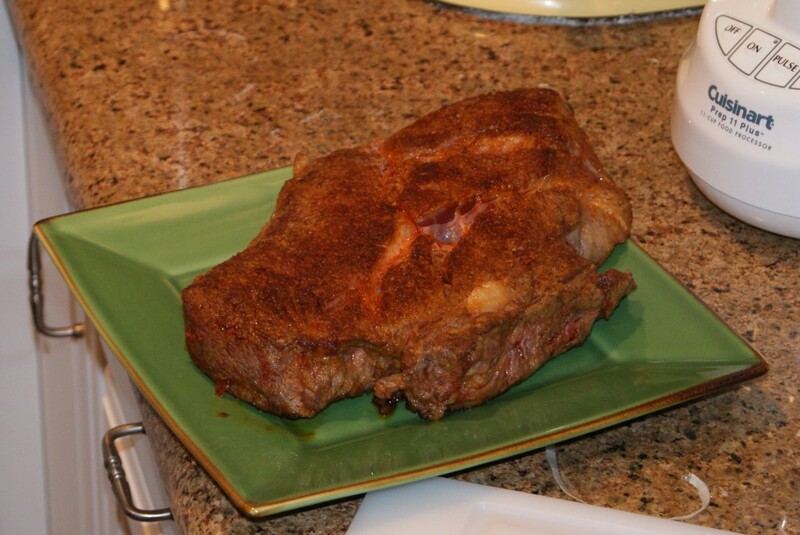 Use tongs to remove chuck roast to a bowl. Use two forks to remove just the meat portion to a separate bowl then shred. Discard fat and other parts. Then return shredded beef to stew, stir and season to taste. Serve with a crunchy garlic french bread. Happy eating! You are my hero…a good pot roast can solve all of the world’s problems! Carpe Cupcakes, Jo Lynne! Between dinner and dessert, if we can’t solve all their problems, at least no one will be hungry! I can’t think of much better than dinner and good conversation — I like the title of your blog! Good luck in the competition! I cast a vote for you. just found you via project food blog (good luck!) i LOVE pot roast! i just don’t ever get to eat it b/c my husband is a vegetarian, and i never think to order it when i’m out at a restaurant. will you come over and cook it for me?!? Thanks Jean! I love lemons and anchovies! This truly is a perfect time of year for pot roast. Your mother’s pot roast sounds absolutely amazing. I too use my mother’s recipe. I did change one thing though. I only use grass fed beef. I work with La Cense Beef, and I have recently learned how tasty the meat is. Not only that it tastes great, but it has many health benefits. It is higher in omega 3 acids and beta-carotene which is a good choice when you are concerned with what you eat.